When a beginning woodworker is getting started, inevitably one of the woodworking tools that they're most eager to get their hands on is a router. Why? Perhaps it is the wide range of shapes that can be placed onto an edge that can be quite impressive looking. Or maybe it's the fact that it's just a "really cool tool." Whatever the reason, most woodworkers take a lot of pride in their routers, and their ability to get the most out of them. So, what should you look for when buying a router? Well, first of all, you need to know whether you need a stationary base or a plunge router. What's the difference? Simply put, a stationary base router is one on which you set a specific depth, and that depth stays consistent while using the tool. 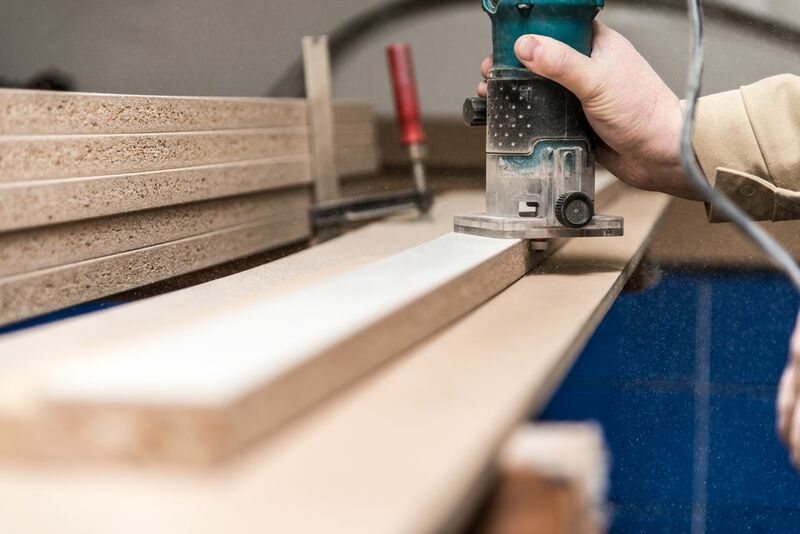 A plunge router, on the other hand, allows you to plunge the router bit downward and into the stock, make the desired cut, and then lift the bit back out of the stock. So, which one should you buy? Well, both, to be honest. A number of routers available today use the same router motor but offer two different bases, so you get the best of both worlds. This is a nice option, but not absolutely necessary. Frankly, I prefer to find a good stationary base router first, and then save my pennies for a really good plunge router later, and convert the stationary base router for use in a router table. When looking at routers, the most important feature to look for is the horsepower rating of the motor. I wouldn't buy any router that is less than 2-HP, as you'll need that power to push some bigger bits through stock. Next, you'll want to spend a little extra to get one that has variable speed control. Single-speed routers are fine as long as you're using small bits, but keep in mind: the larger the bit, the slower the cutting speed needs to be. Otherwise, you're likely to burn the bit. Fourth, the router you purchase should have ergonomic handles that feel comfortable in your hands. Some routers have one large, pistol-grip style handle that you hold with your dominant hand, while your second-hand wraps around the motor housing of the router to stabilize the unit. Other models offer two handles on opposite sides of the base. Choose whichever model feels comfortable in your hands. Not only will the comfort allow you to use the router longer, but it will help to minimize any stress or discomfort in your wrists and hands after long periods of use. No matter which handle style you prefer, be certain that the power switch is within easy reach when your hands are on the router. You don't want to remove your hand to turn off the motor. On a plunge router, the handles are on opposite sides of the base, and the depth gauge should be within easy reach of your thumb without removing your hand from the grip. One feature of top-of-the-line routers is an electronic feedback system that will sense the load and adjust the speed accordingly to try and keep the RPM's consistently in the selected range. A bit costly, but very nice feature to think about. If I were building a new wood shop, my first router would be a well-built, minimum 2-HP, variable-speed stationary base router. If I found a model that I really liked that had an optional plunge base, I would probably consider it, but rather than spend a bunch more for that option, I'd buy the stationary model first, and save for a dedicated plunge router with electronic speed control. Then, I'd move the stationary router to a router table and use the plunge unit for regular routing. Research router reviews on Consumer Search.